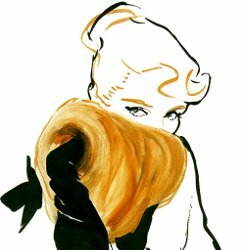 Winter is a great time to wear vintage fragrance. Something about the gorgeous-yet-unfashionable waft of an old perfume is perfect when the wind bites at your face and you’re swaddled in wool. In my opinion, wood fires, old movies and long nights all deepen with a vintage fragrance on your wrist. Friday afternoon I scoped the downtown department stores for something new and interesting to smell. At one department store, the sales associate showed me lots of recent but ultimately uninspiring perfumes — all Angel rip-offs or fruit-ridden musks. We ended the tour at the Trish McEvoy counter where she raved about one of them that ended up smelling like a baby-shampoo-scented candle on me. At Macy’s, the sales associate said there weren’t any new releases for women, only for men. “Maybe Shalimar L’Oiseau de Paradis?” I tried, thinking I could at least look at a pretty bottle. “We didn’t get that one,” she said and turned her back, leaving me neglected in a forest of celebrity fragrances. 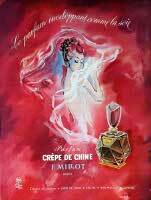 Discouraged, I returned home to a surefire remedy for mediocrity and bad manners: Millot Crêpe de Chine.